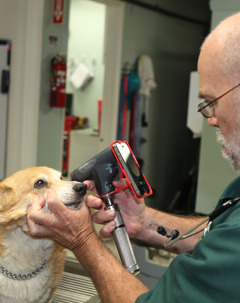 Lawndale Pet Hospital is fully equipped to address pet eye care issues. We understand the active lives the pets of South Bay lead help to keep them happy, fit, and healthy, but increase the risk of injury or coming into contact with illnesses. Thankfully, this is where our veterinarians can offer assistance. When your pet comes in for his or her annual exam, our veterinarians will complete a thorough physical exam, including checking the eyes for any signs of problems. Pets can experience many of the same eye conditions as humans such as glaucoma, conjunctivitis, and cataracts. Catching symptoms early allows our team to develop an effective treatment plan for your pet. Eye is painful — A pet’s eye is painful if you notice he or she has excessive tearing, if it is tender to the touch, the pet is squinting, or is sensitive to light. Cloudy eyes — Especially if the loss of clarity is accompanied by pain, the pet should be seen and checked for keratitis, glaucoma, or uveitis. Appearance of injury — Sometimes there is an obvious injury, cut, foreign body in the eye, or swelling to the eye. Other times, it can be harder to tell, but we encourage pet owners to contact us if there is any question whether or not what they are seeing requires care. Eyelid is irritated — Some pet illnesses can cause the eyelids to swell, become crusted over, or become very itchy to the pet. Eye is sunken or bulging — Because the eye is fluid filled, many different conditions can affect the amount or condition of fluid in the eye, causing it to swell or shrink. Film over the eye — Seeing a white membrane that moves over the surface of the eye can be an indication of a condition called a protruded nictitating membrane. Basic corrective surgery and therapy for eye conditions can be done through Lawndale Pet Hospital, and we maintain an excellent relationship with area veterinary specialists for any eye conditions that require specialized care.